As today is International Women’s Day, I looked at the complaints our help centres around the world received last year to see if there is any gender difference in reporting corruption. Unfortunately, the numbers suggest there is a significant difference: in many parts of the world, women are less likely to report an incident of corruption than men. Women only made 30% of the complaints received by the 35 advice centres. This number is quite stable, the year before it was 34%. In Europe and Central Asia 35% and in the Americas 32% of the complaints came from women. The percentage was significantly lower in Africa and the Middle East (24 %) and in Asia (9%). The countries in Asia were Fiji, Nepal, Vanuatu, Papua New Guinea and, with the lowest proportion of women coming forward, Pakistan. Some chapters have been addressing the gender imbalance by targeting women in their outreach strategy, and it has certainly produced results. Zimbabwe managed to reach out to more than 3,000 women in 2011. You can read more about this campaign in another blog post. Our colleague in Zimbabwe say that 60 per cent of the people they reached out to were women, which compared to the numbers above is a big improvement. The chapter says that before this campaign, only 18% of complaints were from women. Now it is 70%. They receive around 900 complaints a year. Rwanda also grew the proportion of women reporting corruption (from 25% of complaints in 2009 to 43% in 2011). With five centres in the country, they receive around 5,000 complaints a year. In addition to the advice centre, they reached out to more than 1,300 women last year alone. Gender does not seem to be a barrier when our centres try and resolve the corruption problems people have complained about. Analysis of corruption cases brought to centres in 15 Chapters from 2011 shows that there is no significant difference in case outcome by gender. 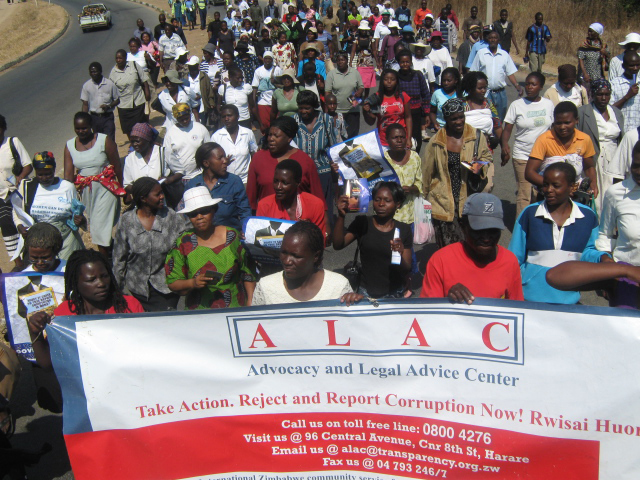 Since we started running advice centres in 2003, our experience is that those behind small-scale corrupt often back down when brought under concerted pressure by our chapters (and sometimes even bigger acts of corruption). Our chapters work by supporting the corruption victims, writing letters on their behalf, for example. Much of our experience shows that gender becomes less of a factor once people address the problem together, and women have somewhere to turn. This shows how important it is to make sure women start reporting the corruption in the first place.